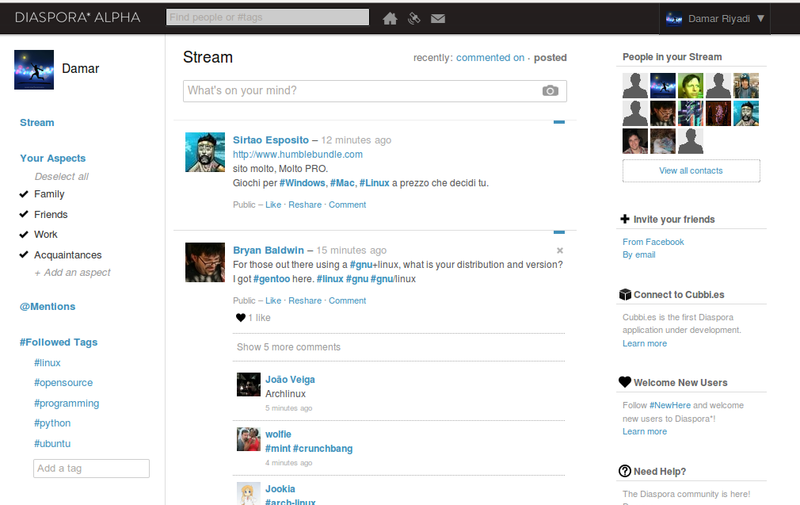 Diaspora: Open Source Social Network is Now Alive, Get The Invitation Here! Diaspora is an open-source and distributed community of social networks run by users that enables you to own your own personal data, control with whom you share, and discover cool stuff throughout the Web. It is a 100% volunteer-run, open, non-profit organization, which means that their users do everything from open-source software development to spreading the word to translations to graphic design to providing support to fellow users, among other things. Unfortunately, you need an invitation in order to be able to join Diaspora. The invitation can be obtained from its homepage, but you must patiently "stay-in-queue" with some others. If you want a direct invitation from me, just leave your email address in the comment form, I don't guarantee you'll get invitation as soon as you fill in your email address, so please be patient. Update: Invitation request has been closed, I'm sorry.